Yikes, I know it's been a long time since my last post — it's not so much that I am lacking content (I am sitting on way too many unpublished photos that I'd love to share eventually), but more so that I've gotten a bit confused about what my blog should portray. It used to be a purely fun and personal space, but now I'm always worried that something I post may turn off a potential future client (who knows what someone might find offensive or off-putting?). And then, I decided to put that notion aside and post about... ankle boots. Yes, seriously. I used to avoid ankle boots like the plague, because I have the shortest legs of anyone I know and ankle boots would not help conceal that fact. Yet, somehow this year I now have four ankle boots in rotation. And they're all very wearable. And they're all at very different price points. I not-so-subtly placed them in height order based on price. So the pair resting on the floor is the cheapest, and so on. 1 / DV by Dolce Vita Jamison Bootie in Taupe. I got these last February on sale and have worn them to pieces since. They were a great ankle boots starter pair. 2 / J.Crew MacAlister Wedge Boots in Mink. At least half of my girlfriends have at least one pair of these. Comfortable and go with anything pretty much. My only issue is that even the size 5 (!) is a bit big on me. And I'm a true size 6, so I'm not sure what's going on there. 3 / A.P.C. Stacked Heel Ankle Boots in Caramel. It was hard to pass these up after miss sophie's glowing review. Then I found them on sale at SSENSE left only in my size — surely a sign nudging me in the right direction. 4 / Burberry Ankle Strap Boots. I had my eye on these for a while when I was looking for a solid pair of black ankle boots. Despite their manly appearance, they won over some Acne and Isabel Marant contenders. I finally picked them up at Bloomingdale's Friends and Family sale. The quality is pretty impeccable, and I imagine they will last me for years and years. I love, love, love my pair of Chelsea boots that I got from here http://www.office.co.uk/womens/office/dallas_chelsea_boot/10/11665/32593/1/. I keep thinking about ordering them in black, but I try to avoid overseas shipping costs whenever possible. I think I'm too picky with ankle boots (and knee-high boots). I'm never going to find the perfect pair for the price range I'm looking within. Either I accept that I have to spend a little more, or I accept that I just can't afford this pair or that pair that might just be perfect. I felt sad(kind of emotional) about the fact that this fun/personal space has turned into a serious(work) affair. The picture is awesome and looks like a brand shoot. As always, you are wonderful. btw, really like the photo too. I like the post! I've been eyeing a few pairs recently. I've strayed from ankle boots as well, just because i'm so short, plus I don't know how to wear them, Pants tucked in or over? I love the J.Crew ones, maybe I should give them a try! 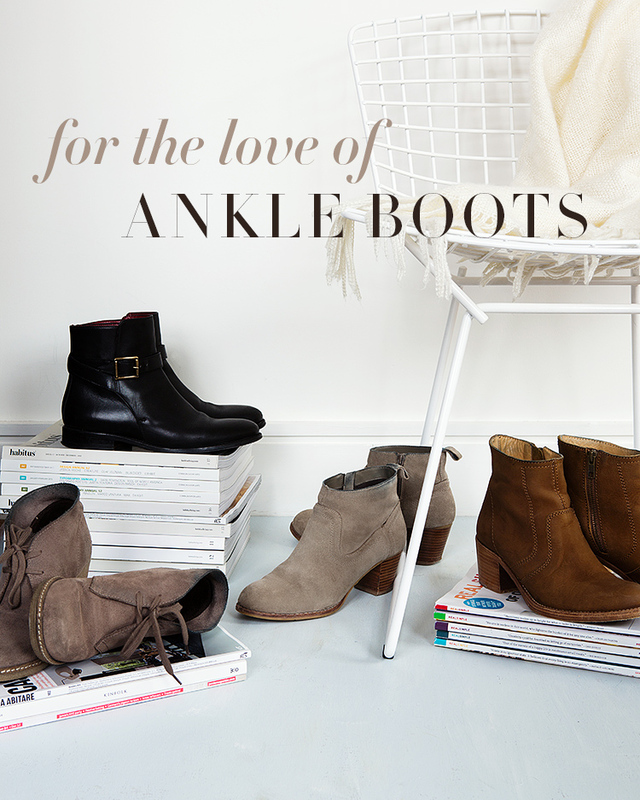 haha, I happen to love ankle boots too! have been only wearing ankle boots this whole winter! your collections are so neat, love all of them! i love when you do fun or personal posts! I am yet to get any ankle boots. I keep hesitating, thinking about the lengthen your leg rules and wondering if I could pull them off with a dress. I love your style so I'm sure you look fantastic in them! You know what I like? That each pair of boots you have is completely different to the other, none the same (like in my own wardrobe). Definitely regret not buying those APC wonders, they look gorgeous! Alice, we're definitely on the same wavelength here. I love how you artfully styled the shots so creatively while I just plonk my shoes on the floor! I only have one measly pair of ankle boots. I'm dying to get a pair in black but knowing my small feet, this process will take forever. i always see the nicest ankle boots in blogs, but whenever i go to stores, i never see any that i like!!! I love reading your blog and looking at New York through your eyes. I can't go with you on the ankle boot - but I do like your personal take on fashion! Love this post. I was quite hesitant to jump on the ankle boot, but recently purchased the Jaimson Bootie and officially converted. Now you need to do a post on how to wear them! Tucked in, out? With skirts/dresses? Just post what you like as you've always done. You can't second-guess yourself or become too politically correct. What you've been doing so far has won you a loyal following, and for all you know, potential clients may be reading your blog anyway, so just be yourself. was just having the blog debate with Kelly P last week. Love your pics and this fun post! This is nice and all, but I want an ankle-boots fashion post, i.e. how do you wear them? so glad you got the A.P.C.s! :D and i love your blog! What if you have size 15 shoes though? and are the insoles flat or built in arch support?